While filming for comedy series, House of Spirits <一屋老友記>, Bobby Au Yeung (歐陽震華) and Carat Cheung (張名雅) narrowly escaped an accident caused by a hammer falling from a local building. 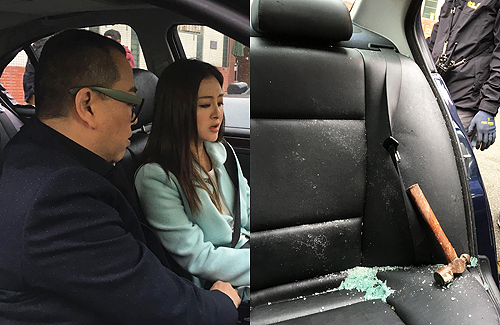 Sitting in the front passenger seat of the car when the accident occurred, Carat recalled hearing a sudden smashing of glass and was initially shocked at the noise. The hammer dropped from a construction site and broke through the back passenger window. Luckily, the cameraman sitting in the back seat did not incur any injuries. After a construction worker came to apologize for the mishap, Carat said the crew decided to not report the incident to the police. However, Carat expressed concerns for future safety and said she will be more careful of her surroundings next time. Sitting in the driver seat, Bobby had just started driving when the hammer fell through. Carat said if the were not moving, the hammer would have definitely hit her. Shaken from the incident, Carat said, “I heard a sudden smashing sound, but I didn’t know what it was because it wasn’t a car crash – after all, this wasn’t an action film. I screamed in the car because I was so surprised. I thought it was some sort of special effects but it was the window exploding! The back window was broken because a hammer fell from above. If the car didn’t start moving, the hammer would have landed where I’m sitting now. I can’t imagine what would have happened if that was the case. It was so scary and my heart is still racing. Wow she and cameraman really escape something bad! That’s a heavy hammer. It it hit one of them, they could be seriously injured or dead! Just glad they are OK and I really hope the construction people will be more careful!